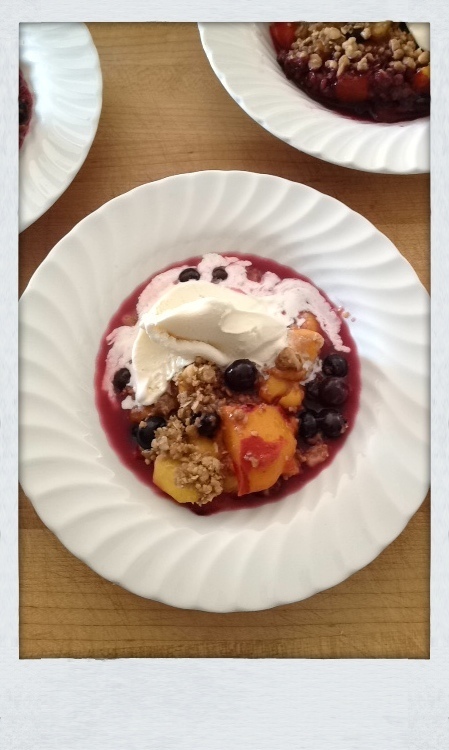 Fruit crisp is a standby in the Watson Sive household, a tasty way to celebrate both Summer and Fall fruits. 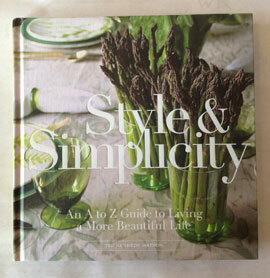 I thought it would be fun to include some recipes by Mister Sive. I would not be a cook at all if it were not from all the knowledge & skill I have learned from watching him all of these years. He is an intuitive cook as well as an amazing baker, where I am much more of a recipe follower and baking is not my forte in the least–he without fail whips up dishes & desserts that always leave folks happy. 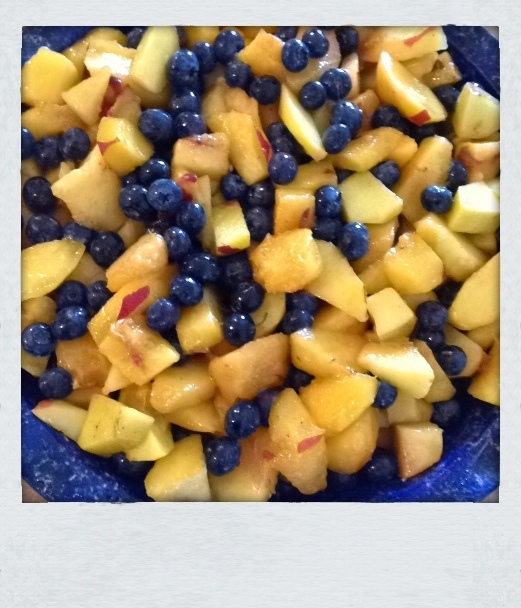 This weekend the Eastern Washington peaches and Vashon blueberries were just glorious, so Ted prepared his version. Skin and cut into big chunks 8 just-shy-of-ripe peaches, and then squeeze in half a lemon for a bit of zing and to protect their color before baking. Add in a cup and a half of fresh blueberries, and 4 tablespoons of white sugar to punch up the sweetness just a tad. He left out cinnamon to concentrate on the fruit flavors. For the topping, he likes using both walnuts and oatmeal to add some crunch and earthy flavor. Cube 6 tablespoons of butter into a big bowl. 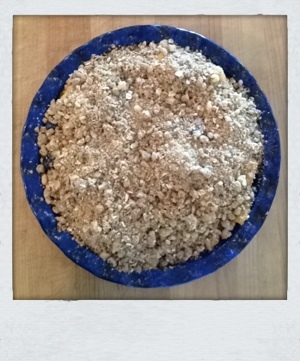 Add ¾ cup of oatmeal, ¾ cup of coarsely chopped walnuts, 3/4 cup of firmly packed brown sugar, and ¾ cup of flour. Lastly, grate in 1/3 of a whole nutmeg, this adds some spice and more earthiness. Ted likes mixing the crisp with his hands, so the butter mixes in really well with all the ingredients, but a pastry cutter or a Cuisinart work well too. Mix until the largest pieces of butter are the size of large peas, and spread over the top of the fruit. He likes baking in this great ceramic pie dish we bought on a trip to Maine years ago, because it’s deep enough to hold a good amount of fruit, and still provide lots of surface area for the yummy crisp. Bake at 375 for 40 minutes. 20 minutes before serving take vanilla ice cream out of the freezer so it softens up a bit, spoon up, and serve! The blueberries will really flavor the natural fruit syrup formed at the bottom of the disk, so be sure to add some of this to each bowl.